Serving as an introduction to 3-Dimensional beadwork flowers, this small daffodil is a simple but delightful addition to embroidery, crazy patchwork and beadwork projects. 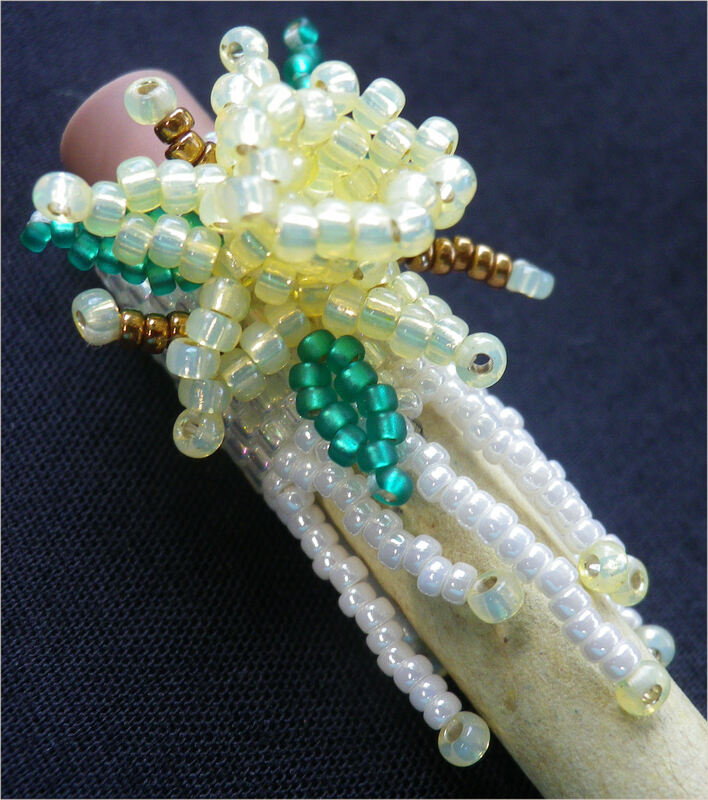 Whether or not you choose to use the flower in other ways, the example in the image has been mounted on an even count peyote stitch base and, with further embellishment, has been used to dicky up the top of a pencil. This pattern is for the entire project. Because, if you embellish your pens and pencils with delicate flowers, it is guaranteed that your husband and son will not walk off with them. Not with a pretty flower on the one end. The pattern includes a colour image of the completed project, a full list of materials needed to complete the project, comprehensive instructions with images and diagrams of the beadwork. Once the payment process has been completed a link will automatically be sent to the email address that you have registered in your account on this website. You will need to click on that link to save it to your hard drive, from where you will be able print it. Please respect copyright by printing only one copy.